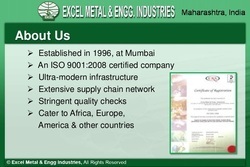 Excel Metal & Engg Industries [Mumbai] are established in the year 1996. Since our founding, we have been engrossed in manufacturing, distributing, supplying, exporting and trading of quality Products to our clients across the globe. Our complete assortment of these products Stainless Steel Pipes & Tubes, Stainless Steel Buttweld Fitting, Stainless Steel Forged Fitting, Stainless Steel Flanges, Stainless Steel Wires etc. Our array is obtainable in a variety of dimensions, sizes and patterns according to the specifications laid by our esteemed clients. We manufacture our products using higher quality materials that are tested for their efficiency, strong construction, resilience and reliability. Our organization is supported by a team of skilled professionals who are highly qualified and experienced. They check each and every activity of the organization to offer a matchless range to our clients. Our organization is having a spacious manufacturing unit that is equipped with ultra modern sophisticated machineries. Our manufacturing unit is managed by a team of experts who are highly capable and experienced. Our team uses the first quality materials that are sourced from the trusted vendors in the market. We produce our collection based on the technical specifications of the customers. We also improve this unit on a standard basis to provide defect free range of products to our clients. We are having manufacturing facility for Stainless Steel, Carbon Steel, & Alloy Steel Pipe Fittings and Flanges, bend, reducer, tee, etc. We are always keep Stock of Stainless Steel - 304, 340 L, 316, 316 LN,316 L, 316 TI, 317, 309, 310 S, 321, 347, 409 M, 410, 420, & 430 Aluminum Alloy Grade of AA-2014.T4/T6. 6061. T4/T6, 5083, T4T6,5086, T4/T6 (HE-15, HE-20 & HE-30) etc. 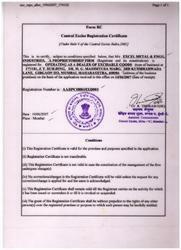 We are getting our standards quality material from repute Manufacturing - Jindal Strips, Sail, Hindalco, Indal Etc. 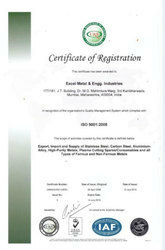 Availability of Bulk or retails supply of Ferrous & Non-Ferrous, Metal of all standards, Grades specifications, Tempers etc. We may mention here that we are committed to Customer - service. We do not Compromise in quality and all our products are subjected To Third party inspection Like : LRIS, EIL, TOYO, BV, PDIL, CHEMTEX, TCS, FADO, KPCIL, RITES, etc. 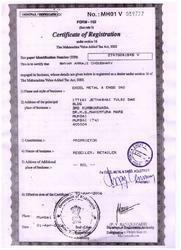 We are an Government Certified company.